In my previous post, I looked a little at the history of medicine – starting in medieval times, when medicine began to be the remit of scholars and we saw the nascent emergence of evidence-based practice. Compare that with early surgery, purely physical procedures performed often by barbers and butchers… anyone with a big knife, really. As medics learned more about the structures and functions within the body, surgery and medicine became more closely aligned, eventually enabling specialization within disciplines based on the systems of the body. Now surgery and medicine are distinct but allied parts of the same profession, and nowhere is there more crossover than in cardiac electrophysiology. I explored some of the pros and cons of the increasingly specialized and sub-specialized – sometimes sub-sub-specialized – nature of medicine in general, and cardiology, electrophysiology, and devices in particular. Now let’s look at some of the benefits of professional specialization into electrophysiology: starting with the ever-growing array of implantable devices we have to help us diagnose and manage arrhythmias, starting with Implantable Loop Recorders – ILRs. ILRs are devices implanted under the skin which recognize and record heart rhythms. The implantation of an ILR is a quick, minimally invasive, almost painless and very safe procedure, with a tiny incision usually done as a day case and with only local anesthetic. It can be done in aseptic conditions in procedure rooms or even at the patient’s bedside. Here we have the Biotronik Biomonitor 2; the Abbott’s (St. Jude) Confirm Rx; and the Medtronic Reveal LINQ. They’re all very small so once they’re implanted the patient shouldn’t have any discomfort or even much awareness of them. The insertion site heals as quickly as any other small superficial wound, with minimal, usually barely visible scarring. So, when do we decide to implant an ILR? When someone comes into your clinic with symptoms that could be related to a heart rhythm disorder, such as palpitations, pre-syncope or syncope, the first thing you’ll do is get a 12-lead ECG. A 12-lead can give us a lot of information about the electrical conduction system of the heart, and there may be underlying problems that a 12-lead shows clearly. The problem is, an ECG taken in the clinic is only a snapshot of that moment in time. What we often need is to have our patient attached to a monitor for a longer period of time. We want to see our patients’ heart rhythm when they have the symptoms they’re reporting. It might be that they only get the symptoms when they’re up and about, so having a heart monitor that allows the patient to get on with their normal life is ideal. Sometimes a patient’s symptoms are serious enough or worrying enough that they’ll need to be admitted to hospital for monitoring, but it’s clearly better, both for the patient and for the allocation of clinical resources, if they can go home while they’re monitored. The next step, then, is a Holter monitor: a 3-lead or 12-lead ECG attached externally that can monitor the patient for up to 72 hours. Some Holter monitors have a button that the patient can press when they have symptoms, or it can be useful to ask your patient to keep a diary of their activities and symptoms. What, then, if your patient comes back into the clinic, has a 72-hour recording of their heart behaving perfectly normally, and no symptoms throughout the recording period? What if they have problematic, even potentially harmful symptoms which sound convincingly like a heart rhythm disturbance, but which only happen, say, every few months? We can’t dismiss a convincingly cardiac-sounding syncope in a patient who’s likely to go home, fall down and break a hip just because we haven’t YET got evidence of their arrhythmia. So, we need to monitor them for longer. Implantable Loop Recorders can monitor your patient for up to three years from insertion (and they’re improving all the time). They can detect a wide variety of arrhythmias, fast, slow, regular, irregular, regularly irregular, and pauses. 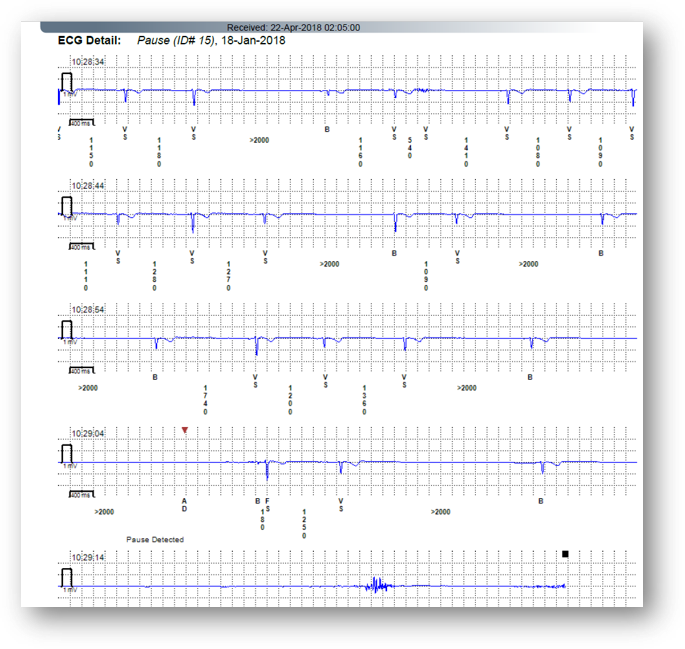 You can set specific parameters according to the needs of your patient – useful when one patient has a comfortable resting heart rate of 47bpm, and another patient hits the floor when they drop below 60bpm. The ILR automatically detects and records heart rhythm disturbances, and transmits information and alerts through wireless technology ( Abbott(St. Jude), Biotronik, or the Medtronic). The information transmitted and stored is secure and compliant with international and local data privacy legislation. The ILR transmits information using a wireless device usually kept at the patient’s home; this device also allows patients to report symptomatic episodes. This can be incredibly useful, allowing the team analyzing the data to match symptoms to heart rhythm disturbances and work out the root cause of the problem. ILRs are purely diagnostic devices: they record but they don’t treat arrhythmias. Once we’ve worked out the exact cause of the patient’s symptoms we may have a few treatment options, so let’s look at some case studies. Here’s a report received from a Abbott (St. Jude) Confirm Rx device. We have a single ECG lead, so we can start to have a closer look and analyze the rhythm. Firstly, we can see P waves. We’re only looking at a single lead, so we’re not going to worry about whether our complexes are positive or negative. Where we can see P waves we can also see that they’re closely followed by QRS complexes and that the QRS complexes are nice and narrow. We can see a T wave after the QRS, so we’ve got a good idea of the heart rhythm and can work out intervals within the complexes. Join our newsletter to get the Ultimate ECG CHEAT SHEET FREE!!! Subscribe to keep up-to-date on all our best content. We won't spam you, and you can unsubscribe anytime. Success! Now check your email to confirm your subscription and get your ULTIMATE ECG CHEAT SHEET! In this report, the device has identified this as an episode of bradycardia. At 49bpm, it’s on the edge of normal limits – this is where we need to think about what the patient was doing at the time. If they were climbing a flight of stairs, their heart rate didn’t increase to meet demand, and they felt dizzy, then we’ve got an answer. If, on the other hand, they’re asleep or resting, and if they were asymptomatic while their heart rate was arguably slightly slow, then maybe we can call that normal for this patient, and we can re-programme the monitor to only alert us of bradycardia at less than, for instance, 45bpm. This is where it’s really useful to be able to find out how the patient felt at the time. We can also see from this report that it is basing its rate on ventricular sensed beats – VS – and it also tells us the number of milliseconds between each beat. We can use this to judge pauses and to work out the patient’s heart rate more accurately, and this is especially useful in irregular heart rates. There are a thousand milliseconds in a second, so a rate of 1000 milliseconds is one beat per second or a heart rate of 60bpm. Our patient has an RR interval – the gap between one R wave and the next – of 1074 milliseconds. So, just slightly less than 60bpm. A little further on it records an 1102 millisecond RR interval – so we’re on our way down towards around 52-54bpm. So, is it bradycardia, or is it normal sinus rhythm? Well, this case is a good reminder that everybody’s different, and all we can say, without associated symptoms, is that it seems to be normal for this patient. 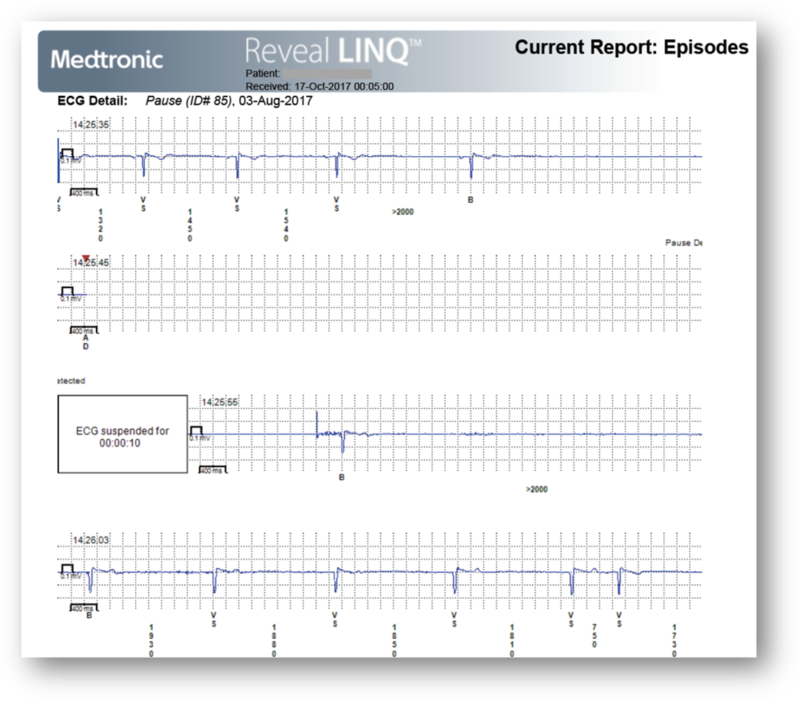 Our next case is a recording from a Medtronic Reveal LINQ device. There are a few differences in the interface of different devices, but they all give us the same information. We have our ECG rhythm strip, we can see that it’s labeled VS, for ventricular sensed events, and we can see the RR interval in milliseconds. So what are we looking at here? It’s not bradycardia, although there are some RR intervals of 1790 milliseconds, and it’s not tachycardia, although there are some RR intervals of only 570 milliseconds. The patient actually marked this as a symptomatic episode, so we need to know what’s going on. Firstly, is this an atrial originating rhythm? The discerning eye might spot a P wave before each NARROW QRS, so we know this is an atrial based beat. It has a P wave, it’s a nice narrow QRS complex, it’s following the right pathways in the heart’s conduction system. On this slide, we start off with 3 narrow QRS complexes, with associated P waves and, although a little slow, they’re regular. However, after our third normal QRS complex, we have an early beat. This has a much wider morphology than our previous QRS and is followed by what we call a compensatory pause. This means that the next normal-looking P-wave driven QRS complex falls in about where it would if there’d been another normal beat preceding it, instead of this bizarre early complex. Then we have the same pattern repeated, a narrow complex beat followed by an early broad complex beat and then a compensatory pause. We call this bigeminy – ‘two twins’. Every part of the conduction system in the heart, even down to every cell, has the ability to initiate a heartbeat. The heart works best when the beats originate from the SA node, at the top of the conduction system, and travel through the normal pathways: the AV node, bundle of His, the bundle branches and the Purkinje fibers and through every cell of the heart muscle. These pathways give us a synchronized, coordinated heartbeat, with everything happening at exactly the right time. As we work our way down through the conduction system, we find that every part has its own intrinsic rhythm that will kick in as a safeguard if there’s no signal from above. More on this in another episode! Why do we think this patient has bigeminy? We know that the patient’s normal QRS complexes are narrow, and the premature complexes are wide, taking up almost 200 milliseconds, and so we might assume that the early beat originates from the ventricles. It’s not following the normal conduction pathways, it’s less synchronized than this patient’s normal sino-atrial beat, so we get a broader QRS. All the premature beats have the same shape, the same morphology, and so we know that they originate in the same place in the heart. 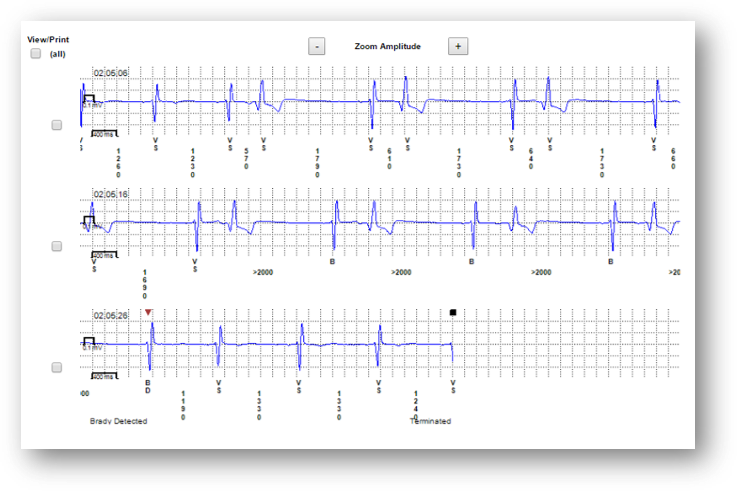 We can get an idea of where the premature beat originated by the shape of the QRS complex, however, to locate exactly where the originating focus of these beats, is if we catch these beats on a full 12-lead ECG. And if we can pinpoint it then we can ablate it – knock out this tiny problem area and hopefully solve the problem completely. Actually, you’ll notice from this ECG strip that the patient has 8 of these bigeminal beats, and then reverts into a sinus rhythm. Although we tend to assume that a broad complex beat is a ventricular premature beat/complex (VPB/VPC), it’s important to remember that you can get also get broad complex beats with an atrial focus which largely follows normal conduction pathways but with some partial conduction disorder. We call this an atrial beat with aberrancy – it can occur when an early beat comes before the heart has completed its refractory period, and so one of the bundle branches is at a more excitable phase than the other. This causes asynchronicity between the bundle branches and a broad complex on the ECG. Whether these are ventricular beats or aberrant atrial beats, we know that our patient had symptoms when this occurred, so we need to get a 12-lead ECG and work out our treatment options, which may be medication or further EP studies with possible ablation. Next, we have a case study of a patient with who had recurrent syncopal episodes, in whom we fitted a Medtronic Reveal device. You can see that the device has flagged up a long pause at 5 am. The patient didn’t report symptoms at this time, but we can probably assume that he was asleep, because we know that had he been awake with a pause of this length he would certainly have known about it. The ILR shows us a few seconds before the event so that we can see some regular beats with slightly increasing intervals, and then complete standstill. The report even tells us that the recording was suspended for 10 seconds while it wasn’t receiving any signal from the heart. So this is a long pause, very long, and then – at last! – a beat… and then another pause, and back to its normal rhythm. This happened! The patient, of course, fainted in the waiting room. We can see on his ILR report that he was having pauses of increasing length, leading to two separate fainting episodes just while he was waiting for his procedure. The patient was very symptomatic and very keen to get his pacemaker! I can’t stress enough how essential the ILR was in diagnosing and ensuring timely treatment of these profound, potentially life-threatening pauses. Our last case study is of a 46-year-old male patient who was referred to us for repeated syncope and pre-syncope events. He’s had an echocardiogram, a 12-lead ECG, a 24 hour Holter monitor, and hadn’t identified any cause for his fainting. We sent him for some fairly invasive catheter EP studies, which were also normal. Without a clear cardiac cause, we referred him to a neurologist, who also declared the patient to be normal! But his symptoms continued, so we decided on an ILR. Have a look at this patient’s Medtronic Reveal Report. As well as the ECG, it can show us graphs of heart rate and rhythm. We can see just from the graph that this patient’s heart rate is all over the place: 60bpm, 150bpm, a completely irregular ventricular rate. You can also see on the ECG that we have a run of this irregular, fast rhythm, then a three-second pause, and then the heart has reverted into sinus rhythm, at a normal rate. So what was this fast, irregular, narrow complex rhythm? We can’t see P waves, so we know that the atria aren’t contracting in an organized fashion. We can see that it’s narrow complex, so it’s not VT, and that the patient comes out of it themselves (and had a pulse!) so it’s not VF. So it’s fast, with no P waves, irregularly irregular, and not terrifying? It’s AF. It’s the most common cardiac arrhythmia, and it always needs some form of treatment, whether we can control the rhythm or rate because it can cause all kinds of problems – most notably an increased risk of stroke. This patient spontaneously reverted to sinus rhythm which is great, so we can say he’s having paroxysmal AF, during which he’s symptomatic. So how do we treat this patient? Well, he had a little pause… should we put a pacemaker in him? Or should we try EP studies again, knowing now that he has episodes of AF, and ablate the root cause? Or should we medically manage his AF with a lifetime of anti-arrhythmic drugs, beta-blockers, and even blood-thinners if we can’t keep him in NSR? We went with the AF ablation, and we left the ILR in for the duration of its battery life so that we can see if we’ve cured the AF. We have! He’s had no episodes of AF, none of the symptoms he used to have, and he doesn’t need any permanently implanted devices or lifelong medication for his heart. These are some of the great successes of ILR technology, which can be an incredibly useful diagnostic tool. In the next episode, we’re going to expand on implantable devices and look at some devices that don’t only record and monitor but can also treat arrhythmias – implantable cardioverter-defibrillators (ICDs). Here at EPme.me we love feedback; our aim is to help you learn so please do get in touch with ideas for sessions you’d like to see. Whether you work in electrophysiology, devices, both or neither, we want to hear from you. Follow our YouTube channel to keep up to date with leading cardiac electrophysiology from around the world. Sign up for our newsletter to receive our free ECG cheatsheet – you’ll wonder how you did without it. COMING UP: Next few weeks, we're gonna be talking about using devices in arrhythmia diagnosis. Some really interesting case studies from devices, to explore further the effects and use of devices in EP.